The Pebble smartwatch is back this summer, looking to appeal to professionals and athletes alike with a new line of products. Pebble debuted a very successful Kickstarter campaign this week, surpassing a $1 million goal in the first hour. 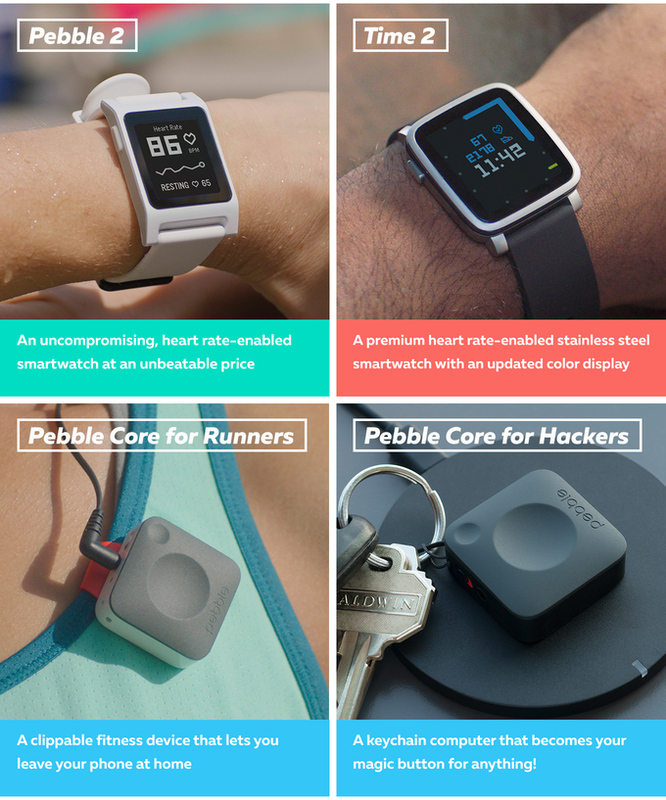 The new products include the Pebble 2, Time 2, Pebble Core for runners and Pebble Core for hackers. The updated versions of the already existing watches now include heart rate monitors and water resistance up to 30 metres. Both of the Core models are new to Pebble, and are geared towards consumers who want a minimalist gadget that limits the need for a smartphone. Pebble claims to be an inexpensive and functional solution for those who are looking for a smartwatch, but don’t want to shell out hundreds of dollars. The Pebble Core will retail for $99, the Pebble 2 for $129 and the Time 2 for $199. Perhaps the biggest change to the Pebble lineup will be the new Core models, which resemble the long forgotten iPod Shuffle. According to the Kickstarter page, Core for runners can stream music from Spotify, sync GPS data and interact with Runkeeper, Strava and Under Armour Record. Core for hackers functions will largely be determined by the user, but the campaign lists some options as calling an Uber with one click, tracking a pet, streaming data from the ODB port in a car or even piloting a drone. The fundraising campaign will run until June 29, 2016 and units are expected to ship between September 2016 and January 2017.